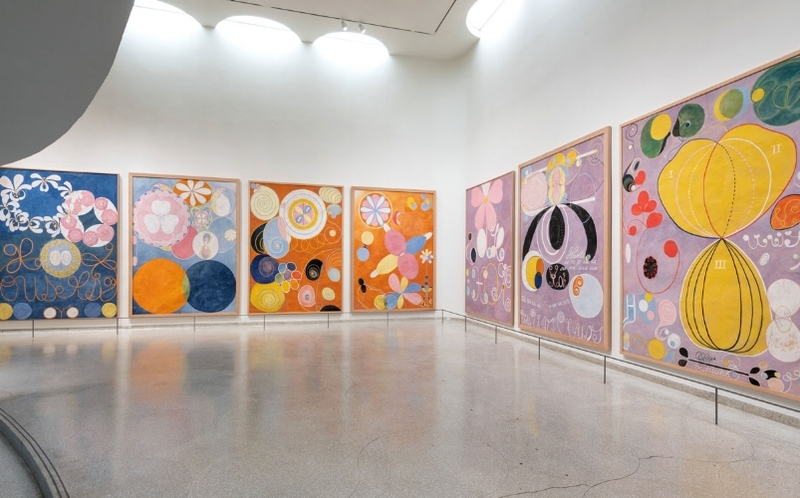 Located at the Guggenheim is Hilma af Klint’s Painting for the Future, a comprehensive body of work that introduces viewers to an unprecedented narrative of abstraction. From 1906-20, Af Klint produced 193 works on paper and canvas that span her lifelong spiritual journey. Despite her works predating renowned male abstractionists, such as Wassily Kandinsky and Piet Mondrian, by nearly a decade, she has yet to gain the notoriety of her male contemporaries. After the death of her sister, Af Klint began exploring communication with the dead by performing séances and contacting the supernatural. In 1906, she was commissioned by a spiritual guide to create a message for humankind— what ensued would be Paintings for the Temple, her life’s work. Much of her work is an inquiry into spiritualism, religion, and Theosophy— an esoteric belief that knowledge of God could be achieved by transcending human consciousness through meditation or spiritual ecstasy. However, also pivotal to this time was the advancement in scientific discovery and its attempt to reconcile with religion. These conflicting theories were not only present, but influential to the progression of her practice, as seen in Evolution No. 14 Group-VI, where she departs from the realm of non-objective subjects and borrows symbols from scientific diagrams. These competing fundamental thoughts are also highlighted in her series, The Swan, as she comments on the dualities of the world— male and female, light and dark, life and death. These invisible forces oppose but balance the world when reconciled. In The Swan, No. 1, the swans represent opposition but upon collision they unify into one, ready to ascend to higher realms. Based on the alchemist theory of the philosopher’s stone, the union of two forces— personified as swans, is necessary to produce the stone. The struggle to unify natural dueling forces is a universal human experience as we attempt to understand how opposing forces complement, interconnect, and depend on each other to create something significant. Looking at her abstract works, you can discern a stark contrast from those of other male abstractionists at the time. Her elemental, non-objective paintings do not feel as self-aggrandizing as those of her male contemporaries. With light blues, yellows, and pinks worn into each painting and curvilinear lines and forms, it lacks the hard-edge, geometric form, and angular absolution of abstractionists such as Mondrian and Malevich. Instead, we see soft round spiraling shapes symbolic of the winding journey towards enlightenment, subjects reminiscent to blossoming flowers, and pastel colors that compliment and marry rather than assert and compete. Equally important to her message is her ability to give viewers a deeper insight into the conception of abstract art. The unchallenged origin of abstraction is believed to have begun from dissolution caused by the war, as well as shifting sentiments caused by scientific and cultural evolutions. What resulted was the birth of a new art movement where artists created nonsensical, nonrepresentational, symbolic works that reflected confusion and disarray. Af Klint’s profundity and progressive outlook on abstraction was unchartered during her time which convinced her that her works would not be widely understood. In her will, she requested that her works not be exhibited until two decades after her death. Perhaps her apprehension is what caused her male peers to advance ahead of her and be accredited with the discovery of abstractionism. This exhibition re-writes Af Klint back into art history and helps us gain a wider, comprehensive narrative behind abstraction beyond the one we mostly learn and hear about.